Order Marigold Bouillon Standard (Green) 500g from the Online Health Food Store UK. 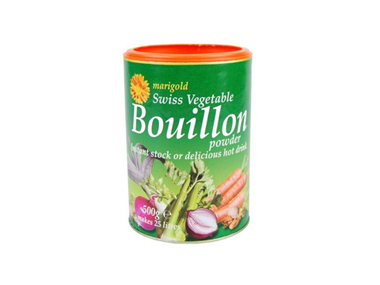 Buy Marigold Swiss Vegetable Bouillon Powder (green tub) 500g and other quality Stock & Bouillon safely online in the UK. Bouillon powder for instant stock or a delicious hot drink. Use bouillon powder to make stock, as a base for soups or stews or a nice warming hot drink. As official Marigold stockist in the UK, we sell quality Stock & Bouillon to customers throughout the UK in England, Wales, Scotland and Northern-Ireland. Marigold Health Foods offer a wide range of Bouillon powder, stocks and gravy suitable for Vegans and Vegetarians. View more products on the Online Health Food Store from Marigold. Where to buy Marigold Bouillon Standard (Green) 500g safely online? Shop at the Online Health Food Store if you are wondering where you can buy Marigold Swiss Vegetable Bouillon Powder (green tub) 500g safely online in the United Kingdom. Our Health Shop is located in the UK and our award-winning independent has been serving customers in England, Wales, Scotland and Northern-Ireland since 1976. You can buy our Health Foods suitable for Vegans and Vegetarians and other quality Stock & Bouillon online and we post out orders to any UK address. Bouillon Standard (Green) 500g - Marigold Swiss Vegetable Bouillon Powder (green tub) 500g in Stock & Bouillon and Herbs, Spices & Salt.